It's taken AMD almost the entire life-span of the Athlon 64, but Intel is finally on the run. Pick whatever measure of success you'd like, whether it is performance benchmarks, the Dell announcement, or being publicly accepted as a threat - AMD has done it. It's because of AMD's extremely successful uphill battle against Intel these past few years that we've had such high expectations from the company. So when Intel first started talking about its new Core architecture, we turned to AMD for a response that it surely must have had in the works for years, but as you all know we came up empty handed. Only recently has AMD begun talking about what's coming next, and it will divulge even more information in the following weeks. The problem is that the architectural revisions to K8 that AMD is finally talking about now are still things we will see in the 2007 - 2008 time frame, while Intel's Core architecture is still on schedule to be a reality for 2006. What AMD does have planned to keep itself afloat during 2006 and until the new K8L core debuts is a brand new platform: Socket-AM2. 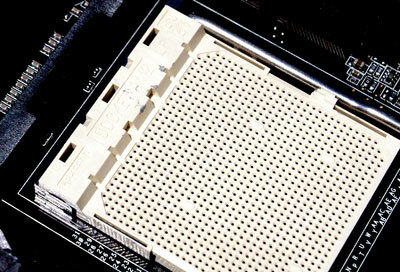 The long awaited Socket-AM2 platform marks the beginning of AMD's transition to DDR2 memory. If you'll remember, Intel made this transition about two years ago with the introduction of its 925X and 915 series of chipsets. The move to DDR2 proved to yield very little in the way of performance, but it was necessary as Intel was able to drive enough quantity of DDR2 in order to make the cost reasonable today. With DDR2 prices low enough, and availability high enough, AMD was poised to take advantage of Intel's work in establishing DDR2 as a desktop memory standard and support it on a new platform. In AMD's uncharacteristic silence over the past several months, performance expectations for DDR2 on Socket-AM2 remained completely unset. A little over a month ago we previewed the Socket-AM2 platform and concluded that even when paired with DDR2-800, you shouldn't expect a performance increase from AM2. While AMD didn't publicly confirm or refute our benchmarks, all of its partners were in agreement with the results we had seen. Today, with final AM2 hardware in our hands, we're able to see exactly how far the platform has come in the month since we last looked at it. Very biased these last few months. Just all his talk about Intel the last few months has been really biased. Not necessarily this article. Just my opinion and I really like this site it just seems like someone is being taken care of. I agree in the last few months, AMD has shown that it doesn't have anything ready to compete with Conroe. I certainly can trust Anand's analysis. Your conspiracy theory is full of it. By the way, just how much AMD stock do you own? I've owned AMD systems since 1998 starting with an Athlon 600 OEM. I've built several other AMD systems since then. Sure, there is a slight chance Intel had some influence on their test systems anand tested but from seeing other pre-release samples around the web I think its just a case of Intel finally waking up and building a good cpu. I hope AMD has a good answer but if they don't and fooled themselves into thinking Intel didn't have the resources or need to build something (like alot of fanboys do) then they were kidding themselves badly. If the Core 2 Duo chips are the best out when its time to dump my X2 4400 then thats what I will be buying. I know AMD is limited in resources but the Dothan should have been a sign of what was coming and made some revisions with the AM2 release. Let's hope the deerhound cores improvements add about 20% IPC so can keep some good competition going between the two companies. I would like detailed PINOUTS for these. eg how many pins are GND, how many power / core power, how many ddr, how many ddr2, how many hypertransport links. Ideally full pinout not just summary by group function. Have anyone managed to benchmark new AM2 platform with RightMark RMMA? It shows the real peak speed (I don't trust crappy Sandra) for mem. read/write. Any results highly appreciated. Thanks in advance!